(Newser) – What are the most endangered primates in the world? 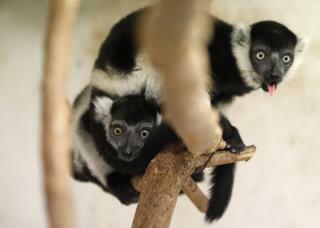 The answer may not be the one you expect: lemurs, according to an analysis by a group of conservationists known as the Primate Specialist Group. The animals are found only in Madagascar (and on a few neighboring islands), and 105 of the 111 species and subspecies of lemur found there are facing an extinction threat. That's 95% of the world's total lemur population that's at risk, notes AFP, and Russ Mittermeier, the chair of the Primate Specialist Group, puts it starkly: "This is, without a doubt, the highest percentage of threat for any large group of mammals and for any large group of vertebrates." What a poor headline. The plight of the lemurs has been known for some time. From the headline I thought that a lemur population had been discovered on a neighboring isle, änd not that the writer was unaware that Madagascar is a "huge island.